I have a couple of friends in General Electric Energy Division. I was continuously begging for having an afternoon when I can see their work. Last week they got the approval to bring in some of their relations and guide them through all things they do. 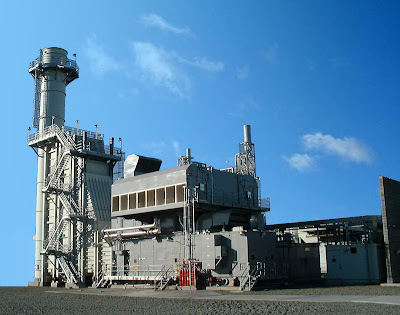 Since they work with LM 6000 turbines, they picked a day when a fully assembled power unit is ready to ignite. Last Thursday was that day. I arrived at 2 pm together with many workers of swing shift. At the main entrance we got eye protector glasses just after the registration. GE has very strict regulations on health and safety, every people entering must be trained. I learnt where I need to wear the glasses, where can I walk in the plant, what rooms I’m not allowed to enter without protective shoes. We have seen large turbine stators under construction in the turning-lathes, large turbine blades, and surprisingly low number of people. We walked through the assembly hall where LM6000s are assembled. 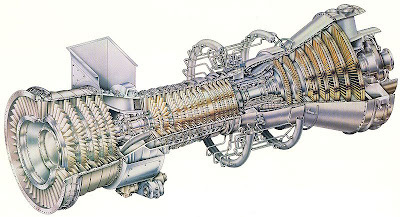 An LM6000 consists of two large containers: one for the turbine unit, and the other for the generator. These containers are fully assembled here including welding, painting, integration of pipes and wires. Of course before installation these two containers get some additional equipment such as air filter, exhaust stack, hydraulic and fire extinguisher module. We arrived to the yard, where the awesome and huge unit was waiting next to the separated test building, fully equipped, and was waiting for testing. The yellow blinking lights around the building warned everyone that the testing is in progress. We have found the testing team in the middle of their work. They seemed to be a FormulaOne team during the race. Each of them had a huge headset with active noise suppression on both the speakers and the microphone to be able to communicate just a few meters from a working turbine. They were locating some cabling problem inside the unit. 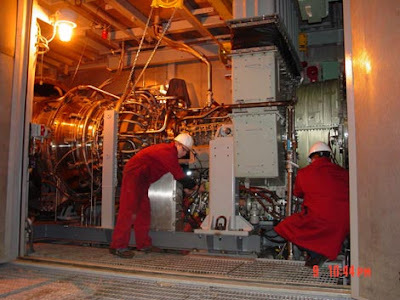 Since they were working inside the unit, the CO2 fire extinguisher system was deactivated, so we were allowed to look inside the turbine and the generator rooms – of course with steel toe cap on our shoes. It was amazing. I was not allowed to take any photos, but believe me: the things inside emitted the feeling of professionalism and preciosity. They were ready and they decided to start cranking up the turbine. This means they start a hydraulic pump that rotates the high pressure part of the turbine up to 2200-2400 rpm, while the low pressure part reaches 200 rpm. This is for purging the air in the system from the air filter to the exhaust stack to avoid any explosion caused by gas leak. During the start up process I saw the team’s professionalism. There is a process they need to follow and all of them know their tasks by heart. When the leader ordered the start all team members began to do their part of the preparation. Some organized fire extinguishers around the unit, some checked the doors and the fire system, one recorded the gas meter and one stood next to the “Emergency stop” button. They did it without any voice. Well organized, well trained team. to be coming together in Boston to master from leaders inside industry. and just how Mitt Romeny lies with what is now often known as “Obamacare”.